Today, Michael Jordan turns 53 years old. In celebration of the GOAT's bday, you're probably going to see endless MJ highlight reels, read about long-forgotten stories from Jordan's playing days and see the number 23 more times than you ever thought imaginable. Tonight, Jordan's alma matter, the University of North Carolina, takes on Duke University, and the two schools will write yet another chapter in the history of their long and storied rivalry. At the moment, both schools are ranked in the AP Top 25, which is nothing new for these two college basketball powerhouses. And it should come as no surprise Michael Jordan was heavily recruited by Duke's legendary head basketball coach, Mike Krzyzewski, back in 1980 because MJ was pursued by every prominent program in America. 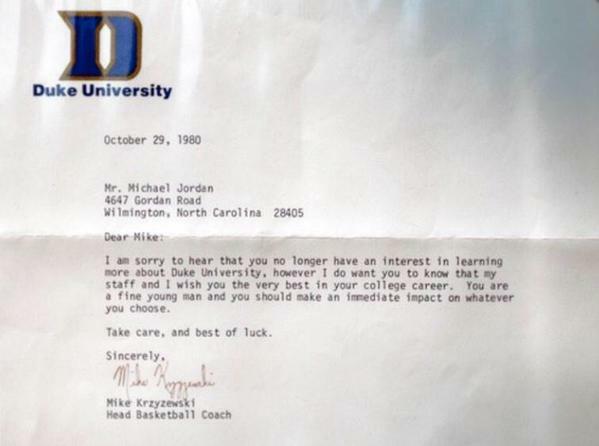 But, I doubt too many head coaches sent Jordan such kind letters after he rejected their schools. To say Coach K had his "immediate impact" assessment of Jordan correct would probably be a bit of an understatement.